Most of the population of Yugoslavia is of South Slavic origin. Slavic tribes entered the region from the north during the 5th, 6th, and 7th centuries AD, where they encountered Illyrian-speaking peoples. Although the Slavs acculturated large numbers of Illyrians, many of the latter retained their distinctive language and customs in the complex hills and valleys of present-day Albania. Cleavages among southern Slav tribes developed over time, particularly after the establishment in the 4th century AD of the north-south "Theodosian Line" marking eastern and western segments of the Roman Empire. Organization of the Christian church was based on this division. Missionaries from Rome converted Slavic tribes in the west to Roman Catholicism (these tribal groups becoming progenitors of the Slovenes and Croatians), while missionaries from Constantinople converted ancestors of Serbs and Montenegrins to Eastern Orthodoxy. The early Serbian homeland was in the vicinity of Serbia's Kopaonik Mountains, including the Kosovo Basin and the region around the ancient capital of Ras (near modern Novi Pazar). After Ottoman armies overran this region in the 14th century, many Serb families fled the southern basins and found shelter northward in the hills of Sumadija. Albanian tribal groups then moved into former Serbian settlements. Two-thirds of the population of Serbia identifies itself as Serb. The principal minorities are Albanians (one-seventh), followed by Hungarians and Bosnian Muslims. Other minorities include Bulgarians along Serbia's eastern fringe and Romanians in the lower Timok River valley across the Danube from Romania. A distinctive group in Serbia is its Gypsies (Roma), who constitute just over 1 percent of the population. Excluding the provinces of Kosovo and Vojvodina, Serbs make up more than four-fifths of the inhabitants of Serbia proper. 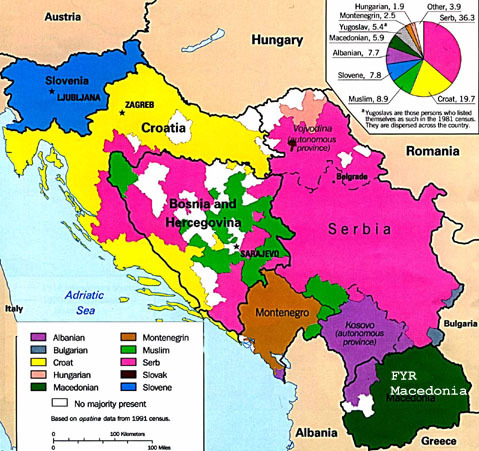 That territory's chief minorities are Bosnian Muslims, located in the southwest, and Albanians, scattered throughout Serbia. In the Vojvodina, Serbs constitute just over half of an exceptionally diverse population. The second largest group is the Hungarians, who form about one-fifth of the total. At one time, an equally large number of Germans lived in the Vojvodina, but the new communist government expelled virtually all German speakers in 1945. This group had descended from Austrian and German families brought to the Vojvodina by the Austrian empress Maria Theresa during the 18th century. Albanians constitute more than three-quarters of the population of Kosovo, an area that most Serbs consider to be their cultural hearth. Serbs accounted for almost one-quarter of the population in 1961, but pressures from local Albanians subsequently caused many to emigrate to Serbia; they now make up about one-eighth of the people. The distinguishing feature of Serbian national identity is the Eastern Orthodox Christian heritage, although probably less than 10 percent of the population actually attended church during the communist era. Throughout history, the autocephalous Serbian Orthodox church has seen itself as the champion of Serbian national interests. During the Ottoman period it waged a long struggle against the influence of Greek clergy based in Constantinople. Because of its nationalist activities, the Ottoman regime suppressed the Serbian church from 1766 to 1832. Unlike Romanians or Hungarians, Serbs do not have a distinct language to set them apart from their neighbors. They speak essentially the same language, Serbo-Croatian, as Croats and Bosnian Muslims, although forms of pronunciation and some vocabulary are distinctive. It is in their written language that Serbs differ from other Serbo-Croatian speakers. Reflecting their religious heritage, they use a modified version of the Cyrillic alphabet-a script originally developed by the Orthodox missionary brothers Saints Cyril and Methodius. Croats write in the Latin script of other Roman Catholic lands. At one time the Serbo-Croatian-speaking Muslims of Bosnia and Serbia used the Arabic alphabet, but they have also adopted the Latin alphabet. Nearly all Serbia's Albanians are Sunnite Muslim in religion, although almost every Albanian village has some Shi'ite Muslim families. Albanian speech is derived from the ancient Indo-European Thraco-Illyrian language, which is quite different from Slavic Serbo-Croatian. Hungarians in the Vojvodina are divided between Roman Catholic and Calvinist Protestant groups. Their Uralic language also is unrelated to Indo-European Serbo-Croatian. The rate of population increase differs markedly by region. Between the censuses of 1971 and 1981, the total population of Serbia grew 10 percent. However, within the republic, the Vojvodina had a net growth of only 4 percent, and Kosovo expanded by an astounding 27 percent. The latter's predominantly Albanian population had a birth rate of 31 per 1,000 population in 1984, compared with an average of 14 per 1,000 for the rest of the Serbian republic. According to the 1981 census, 52 percent of Kosovo's population was under 20 years of age, compared with 27 percent in the rest of Serbia. A life expectancy of 70 years is characteristic of all parts of the republic. Differences between Montenegrins and Serbs are a matter of continuing controversy. Although isolated from each other for centuries during the Ottoman period, when Albanian families came to dominate the intervening Kosovo region, both groups retained their Orthodox religious traditions and many other common cultural attributes-including the Cyrillic alphabet. Because of such obvious commonalties, most Serbs see Montenegrins as "Mountain Serbs," and many, but certainly not all, Montenegrins see themselves as Serb in origin. Nevertheless, during the long period of separation, Montenegrins developed characteristics and institutions of their own. For example, they did not adhere to the Serbian Orthodox church but were led by their own metropolitan until the Montenegrin Orthodox Church was absorbed into the Serbian patriarchate in 1920. In addition, Montenegrin pronunciation of Serbo-Croatian is closer to speech heard in Croatia than to the standard used in Serbia (Encyclopedia Britannica, 1993). Many inhabitants of Montenegro resent modern Serbian attempts to minimize their national distinctiveness, and a strong Montenegrin nationalist movement has developed. Nationalism gained strength in 1969 in reaction to the Serbian Orthodox church's objection to the erection of a monument to Petar Petrovic Njegos (Peter II), Montenegro's great prince-bishop during the mid-19th century. Fluctuations between a Serb and Montenegrin identity have been reflected in Yugoslav census figures. In 1981, for example, 68.5 percent of the residents of Montenegro identified themselves as Montenegrin, and 3.3 percent reported themselves as Serb. By 1991 those figures had changed to 61.8 percent and 9.3 percent, respectively. The largest non-Serb minorities are Muslims and Albanians, the former concentrated in the northern mountains and the latter along the Adriatic coast. Nearly three-quarters of the population of the coastal community of Ulcinj is Albanian.